Gertrude Gilpin Oliver Richards joined Chicago Chapter in April, 1926, where she served on various committees including the chairmanship of the Committee on National Defense through Patriotic Education. She was Director, Vice Regent (1935–37) and elected Chapter Regent, 1938–40. Mrs. Richards was the third “Gertrude” in her father’s family’ the first Gertrude Gilpin was the daughter of one of the pallbearers at the funeral of George Washington. As Chapter Chairman of the National Defense Committee, she established the custom of inviting eminent speakers to address her committee members to acquainted them with the work that should be undertaken by this Committee. She started the work for honest elections, and so great was the response in her chapter that the members donated money to pay watcher in many precincts. Mrs. Richards originated the awarding of medals to honor students of ROTC in the Chicago high schools. When serving as State Treasurer (1949-42) [sic], Mrs. Richards clarified the records of student loans. She also recommended the ten cent per capita charge to defray State Conference expenses, which recommendation became a State Bylaw. Mrs. Richards was an active and interested DAR member. She served as State Regent 1943-46; Vice President General from Illinois, 1949-52. In 1953 she was elected to the office of Treasurer General, NSDAR, and she was a candidate for the office of President General, National Society, Daughters of the American Revolution, at the time of her death on June 8, 1955. Funeral services for Mrs. Richards were held in Chicago on June 11, 1955, with many DAR members and friends in attendance. Miss Gertrude S. Carraway, the President General, and the two Chief Clerks (Mrs. Frances Davis and Mrs. Jeannette Jackson), of the Treasurer General’s office, flew to Chicago for the funeral. 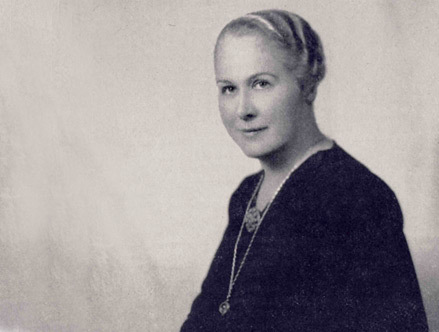 In her tribute to Mrs. Richards, the President General (Miss Gertrude S. Carraway), called attention to Gertrude Richards long and faithful service as a DAR member. At a Special National Board meeting held on June 21, 1955, in Washington, DC, to elect a new Treasurer General, Miss Carraway again paid high tribute to Mrs. J. DeForest Richards, especially her capacity as Treasurer General (1953-55) and conducted a Memorial Service for the National Board of Management. At this June 21st meeting of the Board, a resolution was passed to authorize the acceptance of volunteer contributions for a Gertrude Gilpin Oliver Richard Memorial Fund to place a suitable memorial at one of the DAR Schools. The Illinois State DAR members, from their own Gertrude O. Richards Memorial Fund, purchased a Lowestoft Tea Set for the Illinois Room in Memorial Continental Hall. In addition, funds were contributed to the Approved Schools Memorial Fund established by the National Society, NSDAR, (June 21, 1955), honoring Mrs. Richards for her character, integrity, business ability, keen interest and devotion to our Society’s objectives and projects. Miss Gertrude S. Carraway, the President General, expressed the hope that from Mrs. Richard’s fine example, all would take renewed inspiration and courage to carry on in her spirit of self-sacrifice and patriotic endeavor. (Mrs. J. DeForest) Gertrude Gilpin Oliver Richards was an active member of many hereditary and patriotic Societies: the Plantagenet Society, the National Society of Magna Charta Dames, the Americans of Royal Descent, and the National Society, United States Daughters of the War of 1812. Mrs. Richards passed on in Chicago on June 8, 1955. Contact the web site adminstrator | This site last updated November 2, 2010 | The DAR Insignia is the property of, and is copyrighted by, the National Society of the Daughters of the American Revolution. | Web hyperlinks to non-DAR sites are not the responsibility of the NSDAR, the state organizations, or individual DAR chapters.